Having never sat behind the wheel of a car before, within 2 quite intensive weeks I had passed my test on the first attempt! Nothing about driving came naturally to me but with Dave’s encouragement and helpful teaching techniques everything soon started falling into place. He was really flexible about fitting me into his schedule, and always remained calm and patient, even when I thought I’d given him reason not to be! If I did something wrong Dave would make me repeat it until I got it right ,which really reinforced everything I was learning and left me walking away from each lesson feeling positive. 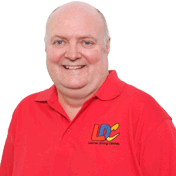 I used the LDC driving skills workbook and DVD before the course which meant that as soon as I got in the car I already knew the principles and from the word go I was getting on and giving things a try, it felt like no time was wasted in my lessons. After my shaky start Dave told me he could teach me everything I needed to know, but the one thing he couldn’t give me was confidence. 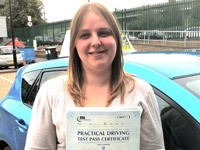 Although that is exactly what Dave gave me, I left my test feeling confident that I can now drive safely and continue to build on everything I’ve learnt I can’t recommend Dave highly enough! I'm a driving instructor in Hextable, Dartford, Bexley, Bexleyheath, Crayford, Crockenhill, Orpington, Keston, Bromley, West Wickham, Maidstone, Rochester and surrounding areas.